I speak from experience. When you’re starting out you always want to fill up your tool box, and those poorly chromed sets of tools look so inviting. Also, why would you buy the $22 pair of wire cutters/ strippers when you can buy a whole pack of electrical tools for $19.99? I own a pair of Klein-Kurve® Wire Stripper/Cutters. I put the registered trade-mark of the Kurve in the name because Klein is obviously damn proud of the Kurve and rightly so. Like all good curves, this is a Kurve that was made to hold in your hand. I look forward to electrical work just so I can use this tool. - This tool is just big enough that it fits in my hand comfortably and yet small enough that it fits in all the tight places you need to use it. If your hand fits in the hole, you can use this tool. - One of the other reasons it is so easy to use , especially in tight places, is it is spring loaded to open when you relax your hand. Brilliant. - The blade on this tool is outstanding. It cuts through or strips wires with ease. Word of caution: If you cut through a wire that has current running through it, it really screws up this otherwise perfect cutting surface, POW (I’m on pair three, don’t tell my wife). - The thing that makes this tool complete is the plier’s type tip at the nose. They are perfect for bending and shaping wire when doing all sorts of electrical work. They are also the perfect size and shape to pull teeth. So remember, always buy good tools. 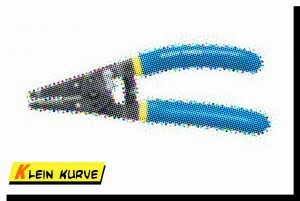 And if you do any electrical work, start with the Klein-Kurve® Wire Stripper/Cutter. I however would love to have a Klein-Kurve if anyone from the company is reading this.